Firespotter Labs, makers of the food photo-sharing app Nosh (and more recently, the hilarious spoof app Jotly), is launching its latest creation today called NoshList, a new waitlisting application for restaurants. The app, designed for the iPad, ties into to the company’s consumer-facing Nosh mobile app, which allows users to rate and review restaurants and dishes from their mobile phones. While the integration between the two apps (Nosh & NoshList) is limited – customers just receive text messages about their reservation with links to download Nosh – it would make sense for deeper integrations to arrive in the future. NoshList’s venue analytics are calculated in real-time, for example, and could be integrated into the Nosh consumer app to provide current wait times. Consumers could then see those wait times and add their name to the waitlist within Nosh, which could tie back into the iPad app. Those features aren’t live yet, but given Firespotter’s background, it would be right in their wheelhouse to move down this path. The company was started by GrandCentral co-founder and CEO Craig Walker, and GrandCentral, as you may recall, was acquired by Google in 2007 where it became Google Voice. Walker left the Google Voice team in late 2010, and later founded Firespotter Labs. In other words, this team knows a thing or two about telephony, and keeping costs low. 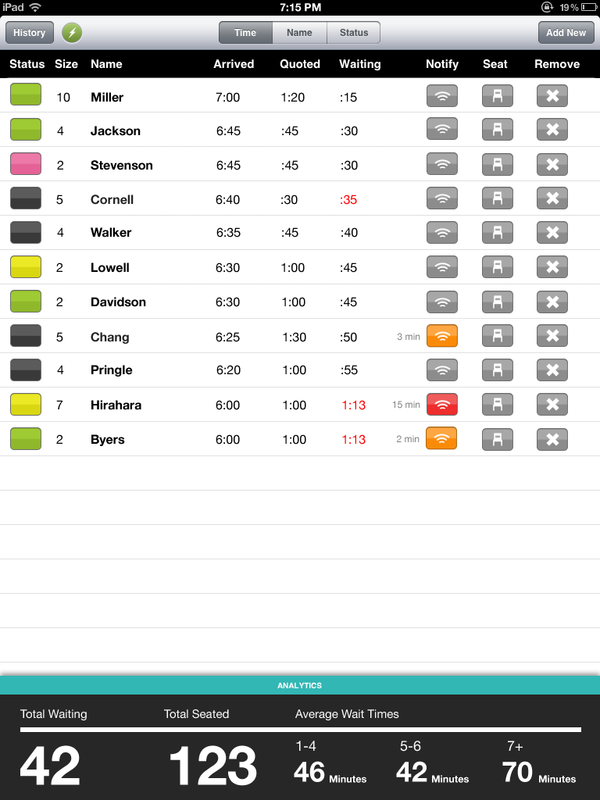 Currently, when a customer’s table is ready, they’re alerted by either text or phone through the NoshList platform. The app also allows the restaurant to easily manage parties – adding, seating and removing them as necessary – just by pushing a button. 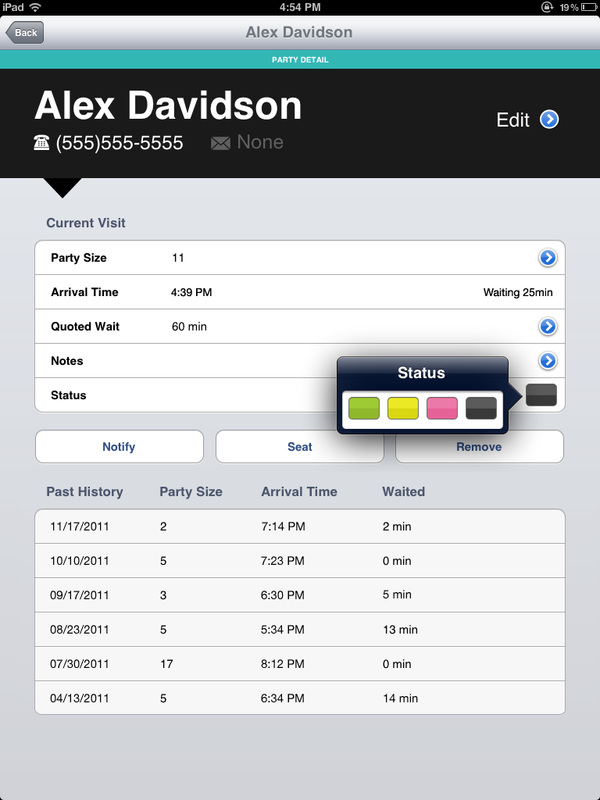 To add walk-up customers, NoshList users simply enter in a name, phone number and tap a button for the party size. There are even different icons for gender and age groups (i.e., blue for boys, pink for girls, and an icon that looks sort of like Darth Vader for “unknown”). At the bottom of the screen, NoshList shows the current wait times by party size for at-a-glance information, as well as the number of total guests waiting and the total seated. NoshList has a lot of competition in the restaurant customer management space – besides OpenTable, there are startups like Livebookings, Timeview, Tableista, NoWait, DinerConnection, WaitList Manager, TurnStar and dozens (dozens!) of others. But Firespotter is offering its app for free for now, with monetization to come later on. Although the company isn’t talking about forthcoming features, things like improved analytics and 2-way paging (meaning customers could text back to the restaurant) are obvious next steps. Prior to today’s launch, the company has been testing the app in several restaurants in the San Francisco Bay area, like Unami Burger, for example. The app is live now on the iTunes App Store here.